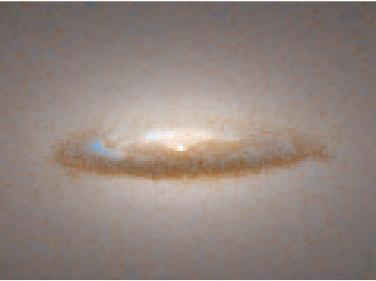 Hubble Space Telescope image of a dust disc around a black hole in the galaxy NGC7022. The disk is 3700 light years in diameter and encircles a black hole with a mass 300 million times that of the Sun. The black hole is at the centre of the galaxy. (with acknowledgments to the Space Telescope Science Institute). I became possessed with the keenest curiosity about the whirl itself. I positively felt a wish to explore its depths, even at the sacrifice I was going to make; and my principal grief was that I should never be able to tell my old companions on the shore about the mysteries I should see. What X-ray sources are there in the visible universe? There are many different kinds of known X-ray source in the visible universe. For a short account click here. Or for a more detailed explanation click here. Of these, two main types which are associated with Black Holes are quasars and X-ray binary stars. Sources which contain a Black Hole will be important targets for XMM which will be used to study both of these types. In the following pages we will explore both of them further.